Vauxhall is revealing its centre pieces for the Geneva Motor Show which will be available to finance. The Vauxhall stand looks like it’ll be drawing crowds, with two world premieres, the Mokka SUV and Astra VXR, and the first show appearance of the Insignia BiTurbo. Based on bespoke modifications made to the Vauxhall GTC chassis, the new Astra VXR is a high-performance coupe. With a 2.0 litre direct injection engine, the turbocharged new Vauxhall has a top speed of 155 mph. Sophisticated engineering features enable exceptional handling and performance including a specially designed limited slip differential system and Brembo brakes. Vauxhall’s FlexRide system is as standard, and on the Astra VXR includes a unique VXR setting in addition to the Sport one. All this will make the VXR Vauxhall’s highest performing Astra when it is released for purchase, lease or finance. The Vauxhall Mokka combines SUV looks, ground clearance and four wheel drive with exceptionally compact proportions. Even though it’s just 4.28 metres long, clever design means that five adults can be comfortably seated inside. The Vauxhall Mokka will come with a choice of three efficient engines, all of which will feature stop and start, reducing fuel consumption. For people looking to purchase, lease or finance a new compact SUV, the stand-out technology selection in the Mokka puts it ahead of its rivals. This includes advanced adaptive forward lighting, using third generation bi-xenon lights combined with a high-beam assist programme. Vauxhall are also making its front camera system available too. 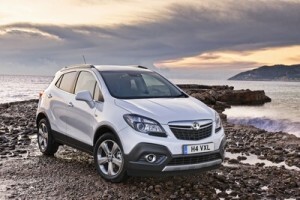 It’s anticipated that the Vauxhall Mokka will be available to purchase, lease or finance in winter 2012. The Insignia BiTurbo is Vauxhall’s most powerful ever diesel. Available for lease, purchase or finance now, the BiTurbo comes with a choice of either Hatch or Sports Tourer bodies, and SRi, SRi Vx-line or Elite trim. Based on an existing diesel engine, Vauxhall have upgraded it to BiTurbo form, adding an extra 35PS of power and 50Nm of torque. Plus the Insignia BiTurbo boasts the Vauxhall FlexRide adaptive damper system as standard. It can use its memory function to learn driving patterns and automatically adjust the dampers. The Vauxhall BiTurbo range features four wheel drive models, all with integrated FlexRide, torque transfer and limited slip differential, enabling superb handling and greater traction and grip in difficult conditions. If you’re looking to purchase or lease a new Vauxhall contact our sales team. Alternatively, visit our website where you will find new and used Vauxhall’s available for sale or on finance.